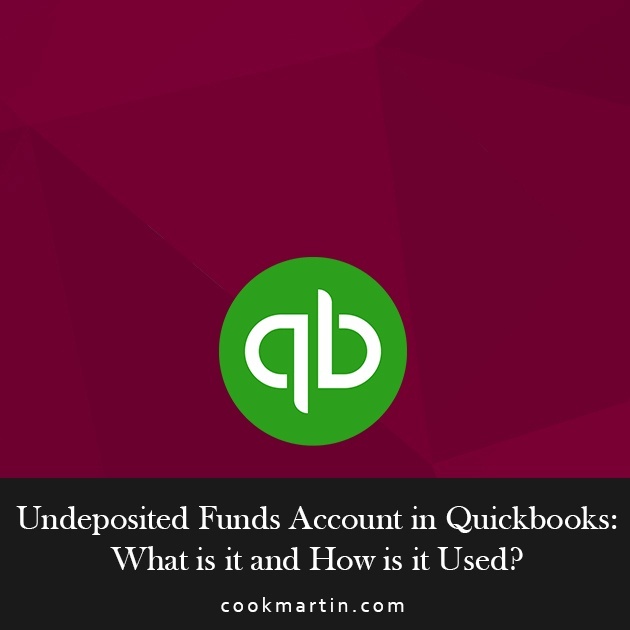 Undeposited Funds Account in Quickbooks: What is it and How is it Used? This post was originally published January 18, 2016 and extensively updated August 15, 2018. You have many accounting software options when it comes to keeping track of your business’ financial accounts. One of the most popular options is QuickBooks. Many people enjoy using QuickBooks because it’s easy to use, has robust features, and can grow with their company. While most of QuickBooks’ features are pretty well-known, there are some that are not talked about as much. One of those features uses the undeposited funds account. Below we’ll highlight this valuable tool and how to use it correctly. What is the Undeposited Funds Account? When it comes to recording sales and payments, most people use the “Sales” account found in QuickBooks. However, the undeposited funds account is an alternative option that can help you keep track of your money at a higher level. Undeposited funds is useful for companies that collect money on a regular basis, but don’t actually deposit the money regularly. Large businesses, in particular, may delay depositing money for several days because it is tedious to deposit one check at a time throughout the working week. If you’re depositing your checks one at a time, which is often the case for smaller businesses, you have to keep careful track of each and every deposit. However, when you use the undeposited funds account, you can record the specific checks in your software and not have to come back to them later to find out which is which. Undeposited funds are like a big bag of money or cash drawer that you would keep your checks and cash payments in until you deposit them at the bank. You have already received the money, but it hasn’t been deposited in your account yet. You’re holding it until you make your weekly bank trip. This is the best way to record payments that have not yet been taken to the bank. 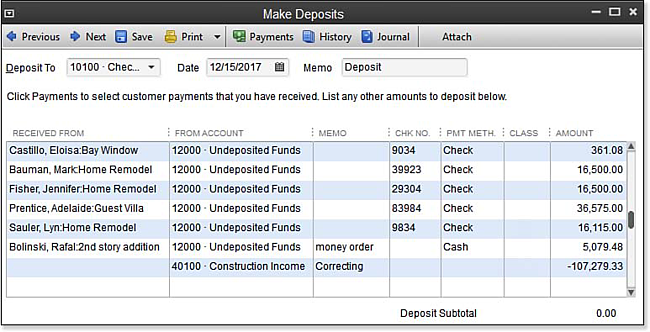 Although you can record it as “deposited”, you’ll create a better representation of your records and accounts by getting into the habit of using the undeposited funds account found in QuickBooks. For a tutorial on how to use this account, we have put together a step-by-step instruction guide. While you are most likely familiar with the navigation system of QuickBooks, it may be difficult to find new accounts, especially if the system has been set up by someone other than yourself. To begin, you need to ensure that the undeposited funds account is enabled in QuickBooks. To do this, go to “Edit” in the menu, select “Preferences” and then choose “Payments”, which is found in the sub-menu on the left side of the screen. 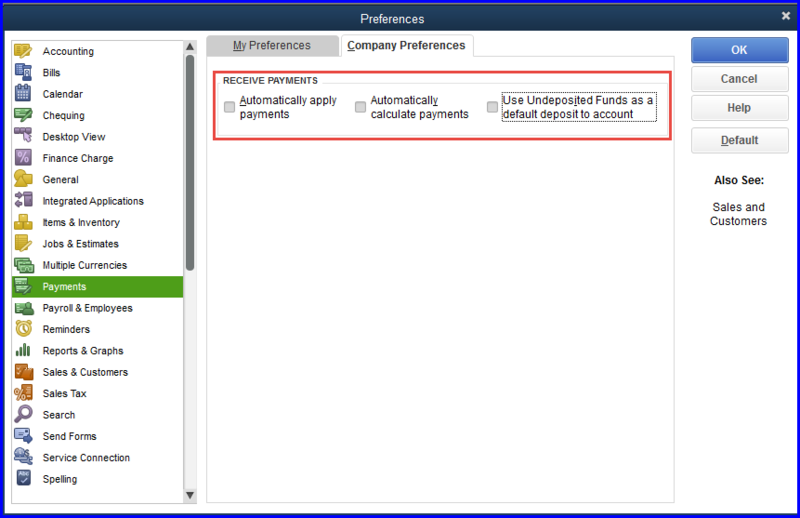 Then choose “Company Preferences” and select the box that reads “Use undeposited funds as a default deposit to account.” This setting will automatically put the money in this account, rather than your sales account, which would default to deposits automatically. This feature can be changed again at any time in the future. Record the payments in the undeposited funds account - which will automatically be done for you once you have enabled the account as described above. Next, use “make deposits” to group many payments into a single deposit. This ensures that you don’t have to add individual invoices and the payments are recorded separately in the ledger. Don’t make the mistake of following the steps above and then forget to group your payments when you make your deposit. If you do this, you’ll end up showing your income as double, which of course, can cause problems for you and your company’s books. To see if this has occurred, check the balance in the undeposited funds account against the balance sheet report. When it comes to keeping your finances straight, QuickBooks does a brilliant job of providing simple yet effective tools to see the flow of money in and out of your company. Using features such as undeposited funds accounts means that you benefit from a more robust accounting system, with more checks and balances, and a better understanding of where your money is at all times. It can be frustrating to correct issues in QuickBooks when they happen, but you can avoid these mistakes by using the proper accounts for the proper transactions. If you run into trouble along the way, don’t hesitate to reach to us. 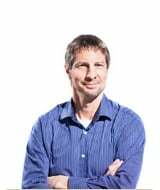 Cook Martin Poulson, PC would be happy to help you make the most of your QuickBooks experience and ensure your accounts are up to date and accurate.